Cartesian parametrization #1: with . obtained by substituting in parametrization #1. Cartesian parametrization #3: , obtained for . Cartesian parametrization #4: , obtained for . 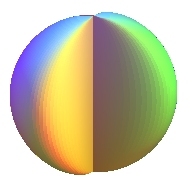 Quartic one-sided surface, special case of Steiner surface. 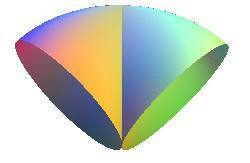 The cross-cap is the image of the quotient sphere with antipodal points identified (i.e. the real projective plane), by the map: . The cross-cap is one of the simplest immersions of the real projective plane into . 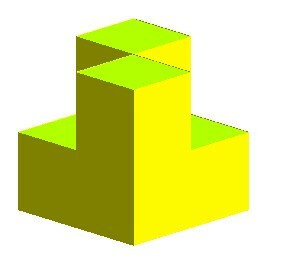 Another construction, starting from a disk with its edge twisted to a figure-eight, with already a self-intersection. Some authors use the term cross-cap to refer to a holed cross-cap: . 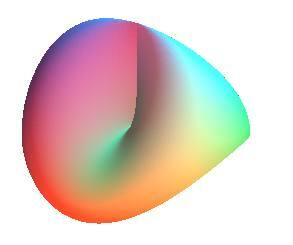 It is then really a cap in the physical sense, but from a topological point of view, it is a Möbius strip. First family (cf. parametrization #2: the sections by the planes containing Oz with polar angle q are the ellipses, with secondary vertices (0, 0, a) and , and constant major-axis equal to 2a, and with equation: so that the cross-cap can be seen as the surface generated by an ellipse with major-axis 2a with constant length turning around its minor-axis while a vertex is fixed on the axis and the other vertex oscillates on that axis. 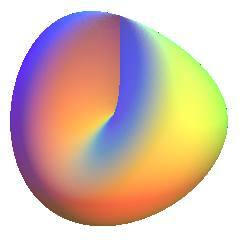 If the previous ellipses are replaced by circles, we get a circled surface with cylindrical parametrization: . 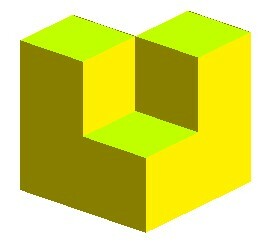 This latter surface, homeomorphic to the previous one, is the image by inversion of the Plücker conoid of order 1, the lines of the conoid becoming the circles of this cross-cap. Second family (cf. parametrization #3): the sections by the planes containing Oy are the ellipses: ; their major-axis is constant equal to a, and their minor-axis oscillates between 0 and a (the zero case corresponding to the self-intersection segment). This proves that the cross-cap is a special case of sine torus. In blue, the locus of the vertices. Third family (cf. parametrization #4): the sections by the planes are the ellipses: , with principal vertex (0,0,a). - ovals for -a < h <0. Here is a polyhedral version of the cross-cap. Be careful, this is not a true polyhedron: the double central edge is common to 4 faces. The cross-cap must not be mistaken for the pseudo cross-cap: with Cartesian equation: and parametrization , for which the horizontal sections are lemniscates of Gerono and which, despite its double line and its cuspidal points, is not a one-sided surface.